GoTech Digital Pvt. 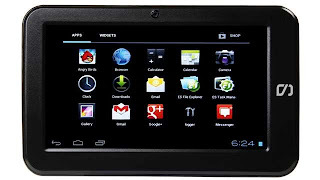 Ltd. has launched Funtab Fit, an Android 4.0 tablet loaded with healthcare, education and entertainment apps. This new 7-inch tab is available for Rs 5,999 and comes with a one year warranty. “What’s more, the Hungama MyPlay and Hungama Bollywood App enable users to download and create their own playlists of music and other entertainment content. Users have an access to more than 3000 videos and 6000 songs besides the latest Bollywood gup-shup, movie reviews etc. funtab fit also comes preloaded with more than 20 fun loving games and applications like Angry Bird, Tic Tac Toe, Crossword, Chess, Solitaire, Minesweeper etc. Users may also choose from more than 1 million apps from FunBazaar, the android app store, to play, enjoy and have fun with,” adds Gaurav. Go Tech has a tie-up with Ozone and every time one visits an Ozone hotspot which is available across major malls, cafes, restaurants, hotels, hospitals, railway stations etc., the consumers of the tablet can avail of free Wi-Fi connectivity. Sandeep Popli, Country Manager, Go Tech Digital says, “Tablet is no more a metro product and with demand coming from various sections of the society it is important that we ensure availability of the product across the country. We intend to leverage on the extensive network of our national distributor Supertron and reach out to prospective buyers across the country. We are also ensuring that customers are able to buy from various online portals and soon the products would be available at large retail stores too. Besides this, we shall continue to strengthen our support network which already has a pan-India footprint."